We know that you were dreaming about the outfit of your Big Day since forever! But the problem comes where you actually start preparing for it and could not decide whether to buy it or rent it. While buying lehenga takes on a heavy load on your budget, renting it could not satisfy your mother-in-law to that extent. Neither do we support one particularly. So here is a short outlook on Buying Bridal Lehenga and Bridal Lehenga on Rent to untangle the queries you have! 5 months from now or 50 years, your bridal outfit will always stay as a remembrance of the biggest day of your life. Remember pulling out your outfit after reasonable years and flashbacks of all the band baja and baraat in front of your eyes. What a bliss! Also, a lot of brides still believe in heirloom of their bridal outfits which is possible only if you buy one. While a bridal lehenga on rent has to be returned. Put on your shoes and grab a water bottle and be ready to forage Chandni Chowk (or any other that your aunt suggests) for your big day Bridal Lehenga! Buying lehenga gives you a bigger choice. Usually, stores providing rental based outfits have a lesser choice and rigidly have to choose amongst them. The stores providing bridal lehengas on rent, update their collections in months and all the aspirations you had from your Instagram research, goes quite in vain. While buying you keep in head everything starting from necklines to colour combinations! Bridal Lehenga is probably the biggest outfit-investment that you will make. Buying a lehenga makes you swing between a limited budget and more choices. While some brides end up being dissatisfactory about their outfits, others seem to cut short their wedding expenses from other things (crucial or not so crucial) to make their outfits better. Rental bridal lehengas, on the other hand, reduces the cost of the outfit. 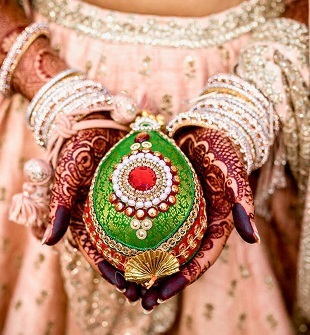 Bridal lehengas are worn only once but are stored forever. Not just this, they do not have an easy shelf maintenance and have to be cleaned regularly. Any little hamper to your bridal lehenga during storage will cost you more than a major hamper in any other outfit of your closet. Renting the Bridal outfit saves a lot of money. Though the amount of security is usually equal to that of the price of the Lehenga, the overall cost of returning it comes out only to be 10%-20% of the price. This is preferable over spending huge figures on one outfit that too for one-time usage. It also cuts the preservation cost of the bridal lehenga in the long run. Rented Bridal outfits are returned within few days and thus no storage issues are related to it further. Lehengas that are bought requires heavy storage and also have to be cleaned regularly. Dreamt always of a designer lehenga on your big day but found it too harsh on your pocket? Renting is the solution! Many designer stores provide you lehenga on rent. This simply solves the problem of a designer outfit with a total lightness on your bank account. So ladies, get ready to boast about a designer or two! 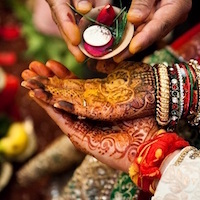 Planning a destination wedding is not an easy task. Especially when you end up having too much luggage to take and carry. Renting provides you easy ways which will let go the hectic carrying of the bridal lehenga. Just rent it from the boutique in your destination city and hand them over before leaving! Renting Bridal outfits takes away every real token of remembrance and you are left with only pictures of your outfit. Many regret never having owned a Bridal outfit of their own. Also, no sort of heirloom is possible in future if you have rent it on your wedding. Any hamper to the rented outfit is recovered by penalty fee. This fee depends on the intensity of hamper but may definitely bring a problem if you are going by a strict budget. 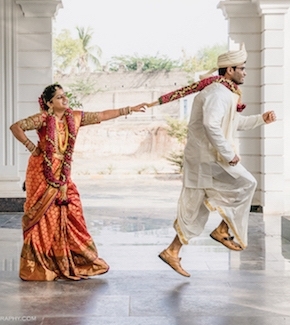 Extra caution has to be taken during the wedding time keeping an eye on the lehenga more than the rituals. We suggest you that check you must thoroughly check the outfit before renting to ensure that there aren’t any pre-existing wear or tear. The major problem that occurs during renting or borrowing is that of the size. Renting stores may run out of some sizes during wedding seasons. Also, to fit into a Lehenga, you have to get it altered which takes few tries to fit. Some stores especially those providing designer outfits only allow limited alterations. Wed-shop is a whole different fun with Mom, Sisters, Friends and even sometimes, aunties. But the major part of it is gone when the bridal lehenga on rent has been chosen. So, do let us know how you liked our pros and cons for buying or having bridal lehenga on rent by commenting. Do like, share and subscribe us if you want to hear more from us.